Stephen Harper’s walk on the beach. 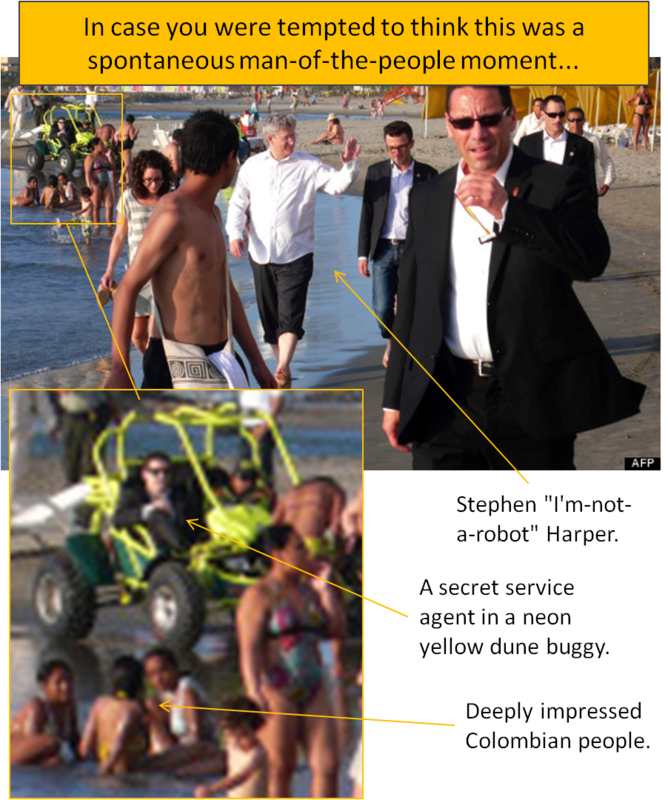 This morning, sales I saw this article in the Canadian edition of Huffington Post: Stephen Harper On The Beach: Prime Minister Takes An Awkward Walk In Colombia. In it, order there was a photo of Stephen Harper walking down the beach in bare feet with his pantlegs rolled up. Wow, that looks really dorky. I’m almost embarrassed for the guy. But, because it looks so awkward, that can’t be a staged photo-op. Good gosh! Maybe the Prime Minister Stephen “Roboshot” Harper actually did something on the spur of the moment. But then I took another look at the photo. What are the chances that secret service guy spontaneously commandeered that neon-coloured dune buggy – or alternately that this is some random guy who likes to dress like the Men in Black whilst dune-buggying?